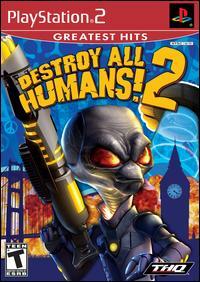 Game description: Destroy All Humans! 2 takes the irreverent Sci-Fi action gaming experience into the swinging sixties with all new game features, expanded open-world gameplay and co-op multiplayer. Assuming the role of the Furon Scout - Crypto 137 - players will embark on another mission to earth to take on the world of free love, the Cold War and other 60's era icons. In Destroy All Humans! 2 Players have access to an upgraded arsenal of weapons and enhanced mental abilities while they battle a variety of new enemies from secret agents and giant creatures to Soviet Forces and ninja warriors. The sequel to Destroy All Humans!. The game is set in 1969, 12 years after the original. The game begins with a KGB slide show meeting showing that the main character from Destroy All Humans!, Cryptosporidium-137, is now deceased for unknown reasons. His clone, Cryptosporidium-138 (Crypto for short), made of more pure Furon DNA, is now taking his place and continuing to pose as the United States President. KGB intelligence reveals that Crypto-138 is the first and only Furon to have genitalia, referred to only as "The Package". Seeing the Furons as a threat to the Soviet Union, the KGB destroy the Furon mothership with a nuclear missile. Soon after, Crypto's new adventure begins. Ingame has corrupt graphics if gsdx is in hardware mode. Looks fine in software mode. Europe v02.20(10/02/2006), INTC Rotation Detection, Haven't found any issues. Playing great with around 30-38 FPS in Full Screen. The game has a built-in 16:9 widescreen mode. To enable it start the game and go to Options > Display > Widescreen menu. Workaround: Switch to Software mode by going to Config > Video (GS) > Plugin Settings, and setting Renderer to any of the "(Software)" options. Alternative Workaround: Go to Config > Video (GS) > Plugin Settings, click "Enable HW Hacks", go to Configure Hacks and set "Skipdraw" to 5. This causes character shadows (and some post processing effects) to disappear and triggers a texture popping issue on far away objects. Description: In Software mode during intense fighting scenes, objects tend to fall through the level(eg. grabbing vehicles with the saucer, NPCs getting stuck in the ground). The player character can have this issue too, but very rarely. The issue might be connected to high CPU usage. Workaround: Go to Config > Video (GS) > Plugin Settings, and set Renderer to any of the "(Hardware)" options. Or press the F9 key to temporarily switch to Hardware mode. Or just avoid too many enemies closing in at the same time. This page was last edited on 1 September 2018, at 10:22.